Ole Gunnar Solskjaer believes his Manchester United side have the talent to surprise people in the Champions League. United face Paris St Germain in the round of 16 on Tuesday, looking to extend their unbeaten run to 12 following a dramatic upturn in fortunes since Solskjaer's arrival as caretaker boss. They remain unfancied in Europe, but Solskjaer said: "I think the squad is very capable of winning against any opponent. When we go into games confident as we are now, in form, we are looking forward to the game." 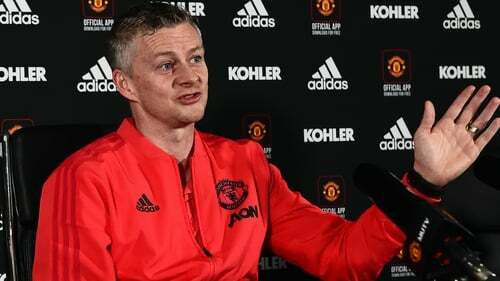 Solskjaer added: "We can't look too far ahead, we've got to look at PSG now and make sure we go through and take the next challenge as it comes. "But I've been very pleased with the attitude. I've said to the boys, we have to keep working every single day. When we work hard, we work hard. When we have lighter training, we concentrate. Then we can improve and maybe surprise people." United face a huge couple of weeks as, following the PSG clash, they face Chelsea in the FA Cup before Premier League title challengers Liverpool visit Old Trafford on February 24. "You need to change the script," he said. "You have so many ways of asking that question. That's too simple. There are still a few more months left of this season for me to do whatever I can for the club." "Of course any team that is missing players like Neymar, Cavani and Meunier will feel the affect," Solskjaer said. "But it gives other players a chance and maybe they are more unpredictable for us with who they are going to play. "When you've see that front three for the whole season you know what to expect but this time around we're guessing a little bit."